Hello, Legions of the Unspoken! I hope the month of March is treating you very well! March is a favorite month of mine! Spring Training is in full gear, and we get to see the Madness of the NCAA Basketball Tournament, both men and women’s! There isn’t a time of year like it for me, and while I am sure that all reading this agree with me that they hope the Kansas Jayhawks win it all (ROCK CHALK…for real, post who you’re pulling for in the comments! ), we decided to delve into Madness of the 90’s comic book variety here at The Unspoken Decade! I think it is illegal for us to call it “March M*****s”, due to NCAA trademarks, and if you think those cats don’t care about the best 90’s Comics Book website on the planet due to its relative small amount of influence in comparison to the monolith that they are, well these are the folks that suspended a player for NOT BEING HOMELESS, so I would not put anything past them. 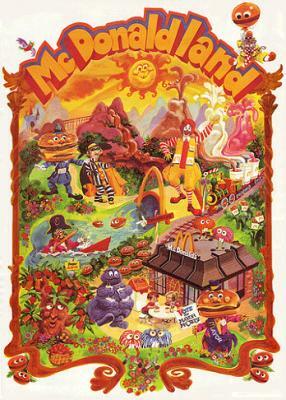 They make the Age of Apocalypse look like McDonaldland. The only tyrant that could ever truly strike fear into Apocalypse’s heart is Mayor McCheese. For not having many features, that face sure is frightening. On the surface, the pairing of Madcap and Ghost Rider seems odd. 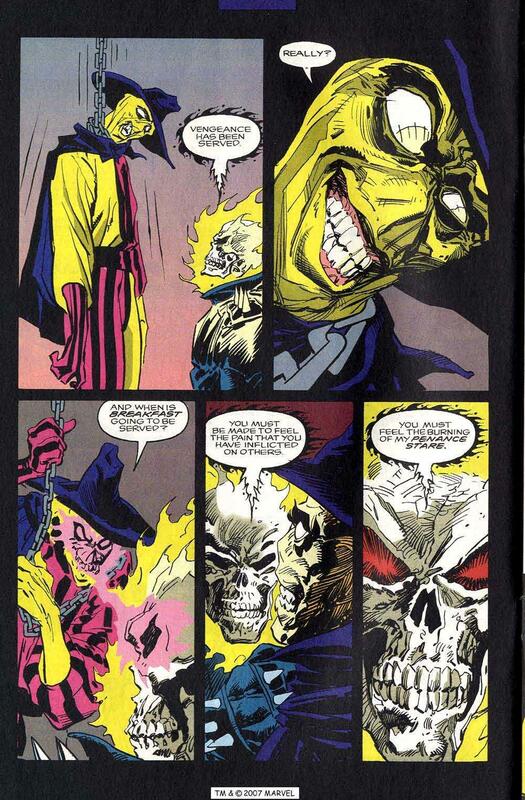 Ghost Rider is firmly entrenched in the occult corner of the Marvel Universe, cavorting about with heroes like Dr. Strange, Morbius, Blade, Werewolf by Night, and others. 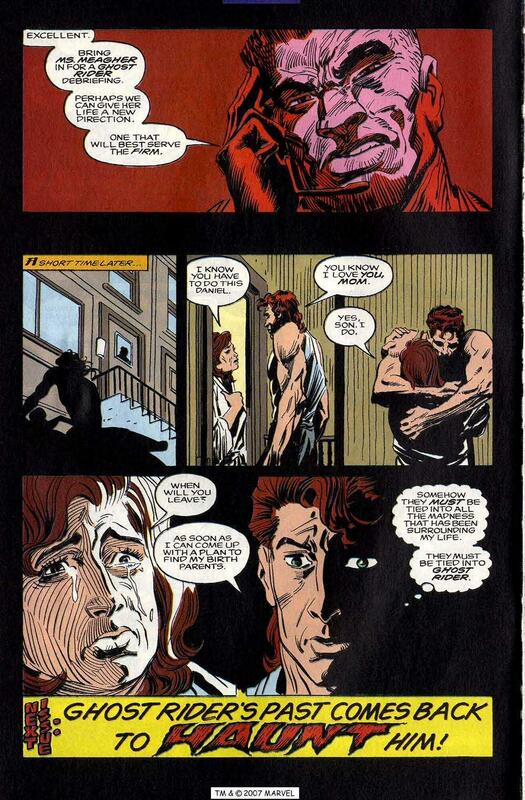 I always wondered why they did not marry this world more strongly with the darker street level titles like Daredevil and Punisher. They tried with the “Marvelution” when they made the Edge imprint (which I plan to take a look at in depth in the future! ), but the big 90’d boom had less breath than a lungless walrus by that time. Too little, too late, and it isn’t like we never got to see Punisher and Ghost Rider or Daredevil and Dr. Strange team up in the 90’s, but I feel like characters with multiple titles in the 90’s could have benefited by having a brand that meshed with a brand for which the character was not known. How awesome would a Punisher Midnight Sons title or a Spider-Man title set in the cosmic corners of the Marvel Universe be? The answer is so awesome that if I don’t stop talking about it right now then I will NEVER cease talking about it. As I started talking about before in the prior paragraph meandered more than the Mississippi herself, on the surface, Ghost Rider and Madcap are an odd pairing. Madcap is highly frivolous to the point of being a walking work of Dada, while Ghost Rider is the SPIRIT OF VENGEANCE and is quite grim, which I do not mean in the pejorative sense that many would use that word in, but I mean that Ghost Rider does not make a ton of jokes and is generally almost as personable as a walking stick. 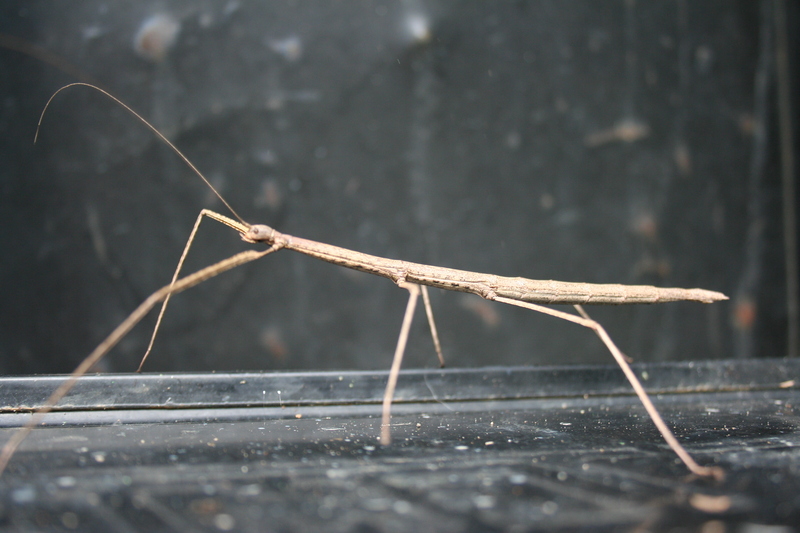 What it lacks in personality, it makes up for by creeping the hell out of you. Then all of a sudden, two things are obvious, the first of which is that these two characters aren’t too different once one takes a gander past the surface. Both are nearly indestructible, both have trouble feeling, and both are engaged in a mission with a singular focus usually only seen in things that cannot think, like thunderclouds. 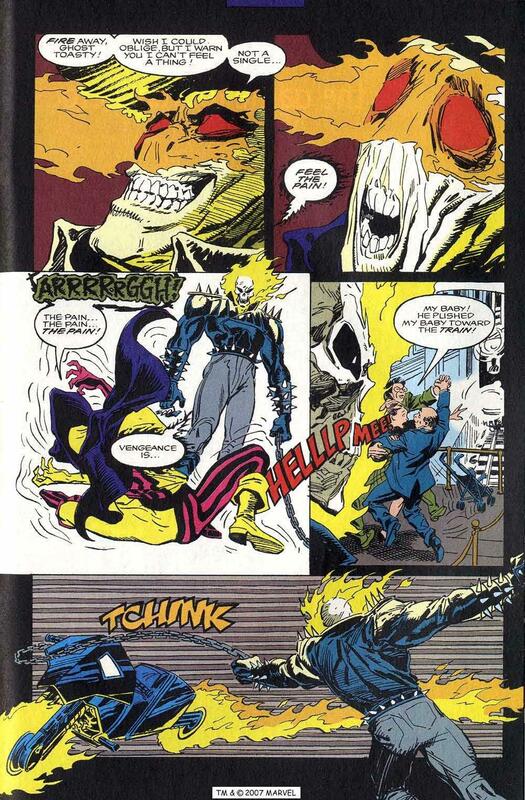 Madcap spreads madness, and this version of Ghost Rider avenges the spilling of innocent blood. There’s not a lot of subtlety to either guy, and it really works for both of them. The other thing is how awesome the clash over their differences shall be. Madcap believes in the idea that everything is meaningless, while GR believes that humanity must be worth something, lest he would cease avenging the innocent and start using his powers to run a furnace or something. I am glad he didn’t go into furnacing because this is a fantastic issue, and Ghost Rider overall was a splendid title! 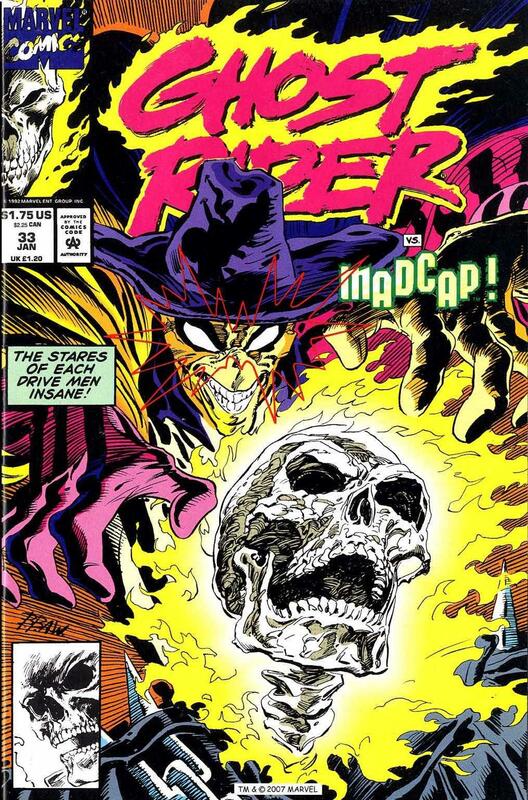 Ghost Rider #33 is one of the first issues of GR after the conclusion of the “Rise of the Midnight Sons” saga. After several months of intertwined stories with the other Midnight Sons titles as well as guest stars in his own title (such as Dr. Strange saving Dan Ketch’s life in the very issue prior to this one! ), this issue stands alone, and it also sets up some major changes in Danny Ketch (Ghost Rider)’s life! This issue can also be read alone without reading prior GR issues; there’s a subplot involving ladies from H.E.A.R.T. getting attacked that would make a lot more sense had one read a few more issues, but it isn’t so opaque as to ruin the comic. I miss the 90’s because they may have been the last era when we would get this sort of comic book, where a superhero story from the Big 2 would begin and end in the same issue. There were still fill-ins here and yon, and these type of issues were a great gateway for someone who did not follow a title to get into a book. For instance, I was familiar with Ghost Rider before this issue, but I didn’t follow it closely. I saw this on the rack at Kroger when I was in 7th grade, and I sat down and read it. Sitting and reading a comic book was preferable to walking behind Mom and somehow always being in the way in the flour aisle, and this cover drew me in. Oh, I forgot to mention earlier that they both have stares that cause mental illness. My bad. I wound up following Ghost Rider for about a year after this issue, which I do not think I would have had this comic contained some convoluted story that continued subplot after subplot that I could not catch up with while being a part of 74092980234 different stories as well. Conversely, though, I would not have given this much of a look had I not been hooked in by the “Rise of the Midnight Sons,” so I guess it works both ways. Normally, I hate it when things have it both ways, but this is delightful. 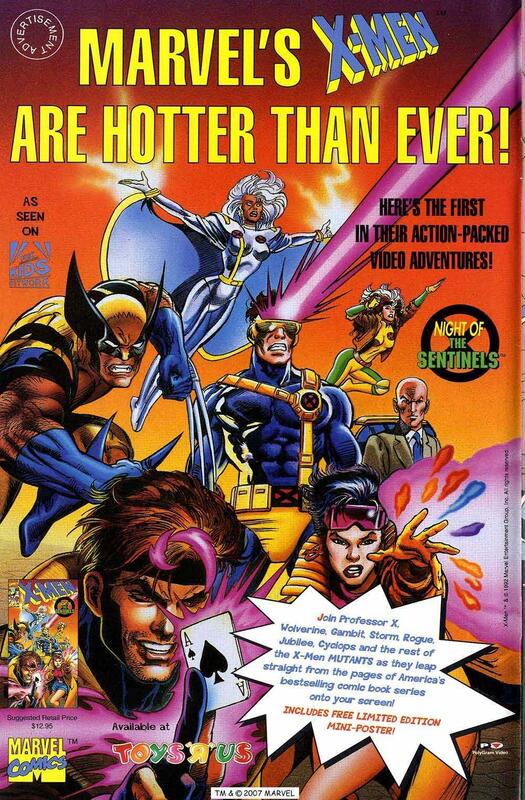 Speaking of delightful, how about the inside cover of this bad boy featuring an ad for everyone’s favorite animated band of mutants, the Uncanny X-Men? Jesus, 12.95 for two episodes on VHS? Before torrents, they made out like kings. Now they only make out like bandits. I also have to wonder about the upper-left-hand corner of this ad, where they let us know that this is an “advertisement,” as though people either thought there was a magic comic book that would open up from the INSIDE COVER of another comic book, or that this comic book page was a VHS tape, and that they had somehow lucked out and did not have to pay 12.95 for two measly X-Men episodes. To be fair though, I would have paid. X-Men was such a huge part of my life in 7th grade. Everyone watched it, and by everyone, I mean all the people at the losers’ lunch table with me watched it and discussed it. LOUDLY. Actually, as I have gotten older, I have found out that even the kids at the cool table were watching, but I had no idea at the time. If I had, I probably would have done much better with girls….no, no I wouldn’t have. The issue starts off with a bang, as not only do we get GR shoving some mook through a window, but we also get existentialism from the get-go! I feel like if we changed these two out for teenagers, and it was just a regular push instead of a choke slam through a window, this would be the start of an ABC Afterschool Special also entitled “What Does It Matter” as “WHY?” is bellowed. Ghost Rider’s absence during the Rise of the Midnight Sons has led certain criminal elements to begin to retake their former territories. They thought they were safe due to GR being gone, but now he’s back with a vengeance! (Sorry, I had to!) I do wonder how these guys dodged the attention of the other Marvel street-level folks at this time, such as Punisher or Moon Knight, whether GR was there or not, but I guess even the lowly street thugs of the Marvel Universe are more resourceful than the ones of our world. One way or another though, they are no match for Ghost Rider, who dispatches them quite easily, and then uses his insanity-inducing gaze, the Penance Stare, to make these criminals feel the fear and pain of their victims. That’s such a stellar idea. The fact that you get the Penance Stare from a flaming skull face makes you feel even more sorry as well, and it gives the Penance Stare a visual that the reader not only will notice, but would FEEL. Every time I saw GR do it, I resolved to be a better person. 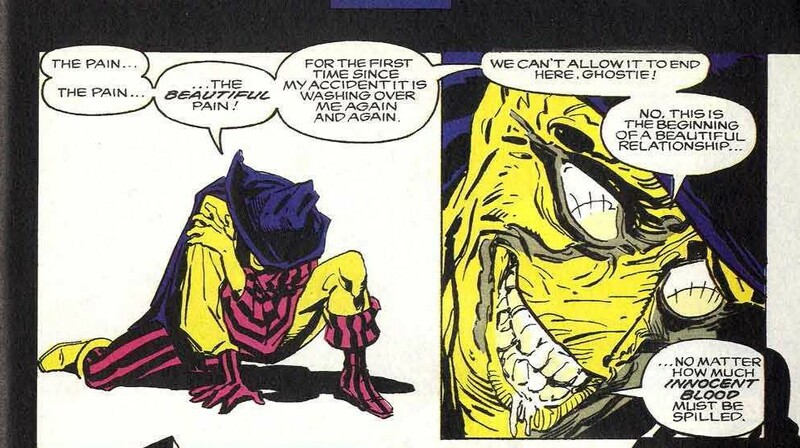 However, that same visual that gives GR the edge in the form of inspiring bowel-emptying paralysis in street level criminals also makes it hard for him to assist the victims of the crimes, no matter how much he wants to. Even if the Penance Stare was nothing but shooting hellfire from GR’s eyes into someone else’s, it would still be awesome. 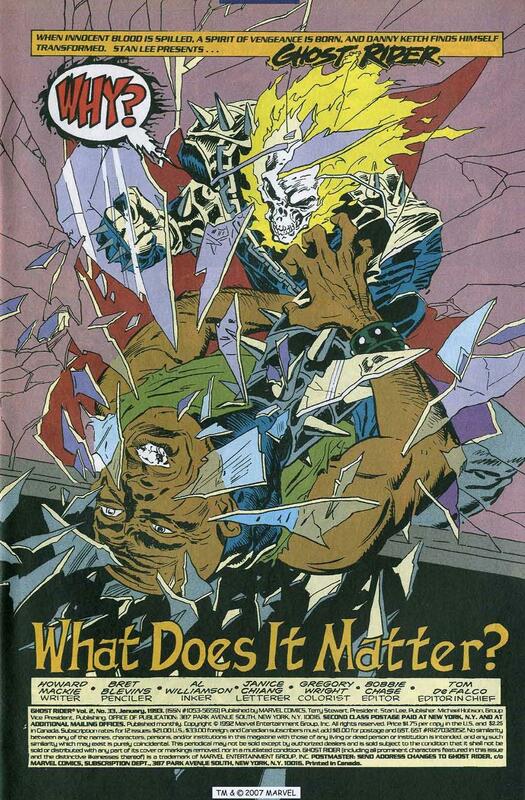 The beginning of the issue is very accurate; Ghost Rider and Dan Ketch are having an existential crisis. Howard Mackie is really good on this title, and he scripts Dan Ketch very well. Dan muses that, “There has to be more to our lives than waiting for the innocent to die.” I never really thought about it, except possibly in the case of Spider-Man and The Last Avengers Story, about how much that must weigh on heroes. There isn’t much for a hero to do but react, and if one is a hero, then the only reaction one would have would be to villainy. Villainy in superhero comics involves massive property damage and massive attacks on civilians, which would result in massive casualties. That’s got to weigh heavily on many heroes. They are powerless to do much of anything but react, and by the time they do that, the damage is done. Dan Ketch is also dealing with having died, so he has more on his mind than even the crisis mentioned above. 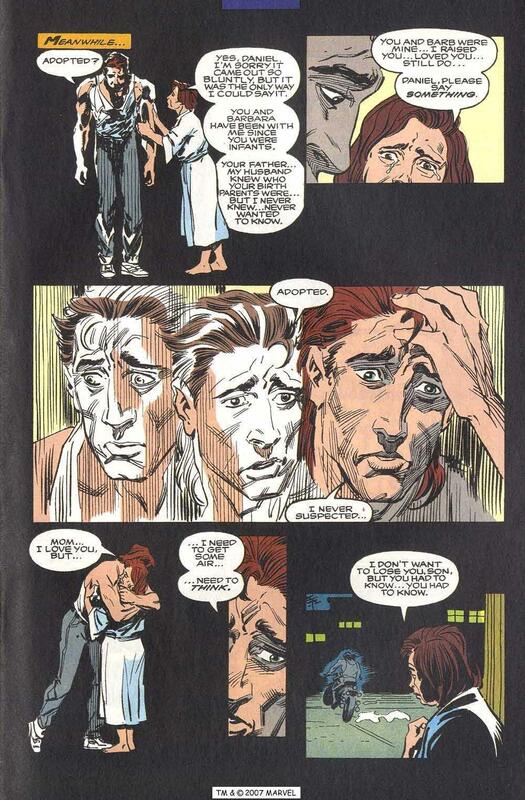 Between all that and a recent encounter with Nightmare, Dan is having issues sleeping, and I have to say that this is the best comic book page in history representing the feeling of not being able to sleep. Bret Blevins, Al Williamson, and the colors of Gregory Wright really make me scared to lay down tonight, not due to anything monstrous in this horror/superhero mash-up, but rather because I will be haunted by floating digital numbers. The floating numbers also remind me of a 1980’s commercial, and I mean that in the best way. Nothing is simultaneously as mocking and haunting as digital numbers when I can’t sleep, whether they be on an alarm clock from the 90’s or my smartphone today. 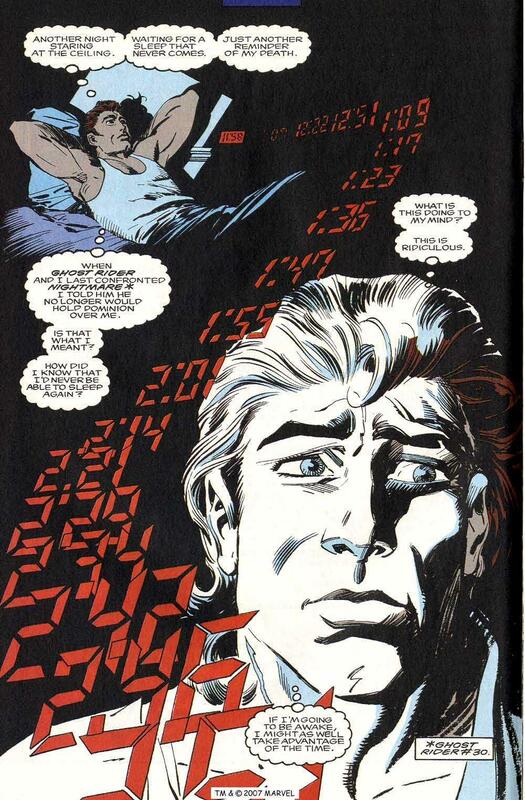 I want to point out that Gregory Wright got the color of the digital clock display perfect. The numbers aren’t just red on those clocks; they’re INSANITY-INDUCING red, and Wright nails that color here, especially against the totally black background. Seeing as how Ketch can’t sleep, he decides to do some physical training, which means hitting a bag again and again. This is the middle of the night, and so his mom emerges to give him some life-changing news. Before she can do that, though, Madcap becomes the envy of just about every body modification aficionado as he laments being misunderstood by the consumers of his art. This is what your parents were worried would happen when they taught you not to play with sharp items. Madcap is definitely one of the Not-Ready-For-Prime-Players with that knife stuff. I can’t help but feel bad for him, though, because I can feel, and apparently, he cannot. That’s more than sad. I’d rather be able to wrap myself in all the sad times I have had rather than be unable to feel anything, no matter what teenage me said as he listened to the same Nine Inch Nails songs over and over again. There are situations, however, where anyone would prefer not to have feelings so that they could deal with heavy stuff better. For instance, Madcap would not really understand the gravity of the situation that Dan Ketch faces with his mom’s big reveal. There was probably a better time to tell Dan Ketch this besides right after he just died. Dan needs to go on a motorcycle ride to clear his head now, which in our world would work out perfectly. In the Marvel Universe, though, it just leads to angst for our hero and a fight with a villain to boot. No hero ever gets to just clear their head; they are required to run into trouble and then deal with it. I am certain that is a physical law in superhero universes. Trouble isn’t quite the word I would use for Madcap, who is certainly the epitome of madness. 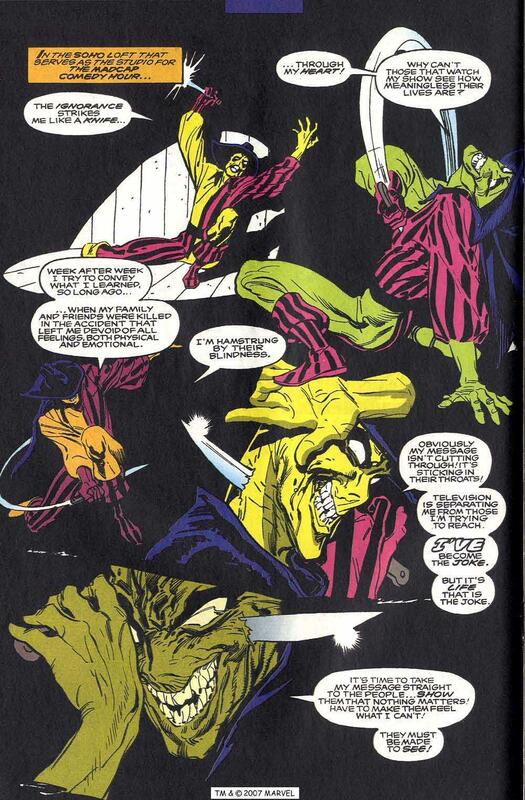 Perhaps even more so than The Joker, though, not because Madcap is crazier, but because he is indestructible. The Joker is mad, certainly. No one would dare call that cat sane, unless he demanded you did or else. Even then, everyone reading this article knows that all calling The Joker sane (even at his request) will get you is the “or else” he is threatening, whether that is getting drowned by a clownfish or having to eat the world’s funniest poison. At the end of the day, though, The Joker is still cognizant that he is alive and can be hurt or killed. Madcap is alive, but he can’t be hurt or killed. In fact, he can’t feel much of anything. That’s the catalyst for his madness. If you couldn’t even stub your toe and feel that awful pain, you’d go nuts, just like Madcap. Madcap, though, is really interested in making other people nuts. Especially folks in Grand Central Station at rush hour. Madcap’s spree spills innocent blood, and that triggers Dan Ketch to become Ghost Rider. Of course, we have to listen to Madcap’s philosophy on life before he gets there, and I wonder how much of this is madness – I mean, other than him inducing the cop to shoot innocent people; that’s firmly in the “Madness” category. His idea that everything is pointless, however, carries some weight with many people I know. One can question what is meaning itself for a long time, and if one can’t answer, does that make things pointless? The folks I know who adhere to this philosophy tend to not be mad (although they are fairly morose and forlorn: think Goth Talk from SNL), but they aren’t very cheery. They just seem to think that there can be no lasting sort of legacy, and therefore, most everything is pointless. Yes, I know some weird people; thankfully, I find enough purpose in bringing the Legions of the Unspoken all these fantastic comic books, so I am not like them! 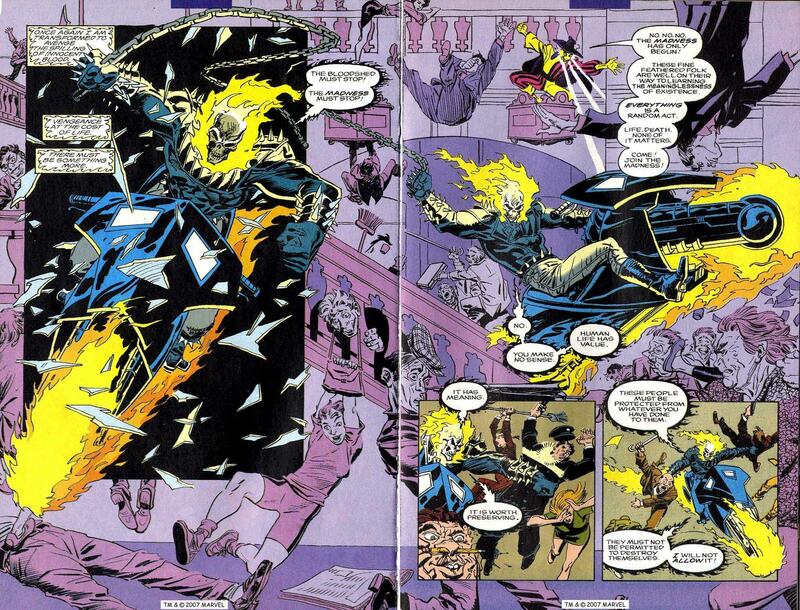 Ghost Rider’s staunch belief in the sanctity of the innocent really flies in the face of Madcap’s philosophy, so they decide to settle it the best way possible; they trade philosophy while punching each other. Also, Ghost Rider looks cool as hell on that motorcycle. Some of them will just find other ways to destroy themselves, Ghost Rider. Madcap has the ability to not get hurt, but he isn’t really known for much else. He doesn’t know, say, Madness Karate, so Ghost Rider and Madcap lock up, it doesn’t last long, and it is decidedly one-sided. Madcap has no chance against the Spirit of Vengeance! The highlight of the fight has to be when Ghost Rider and Madcap swap stares! 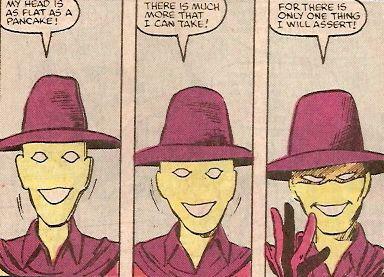 Madcap’s madness inducing gaze could possibly give him the edge in this battle. Make you own “Hanging Around” joke here. Mine involves Counting Crows’s third album. 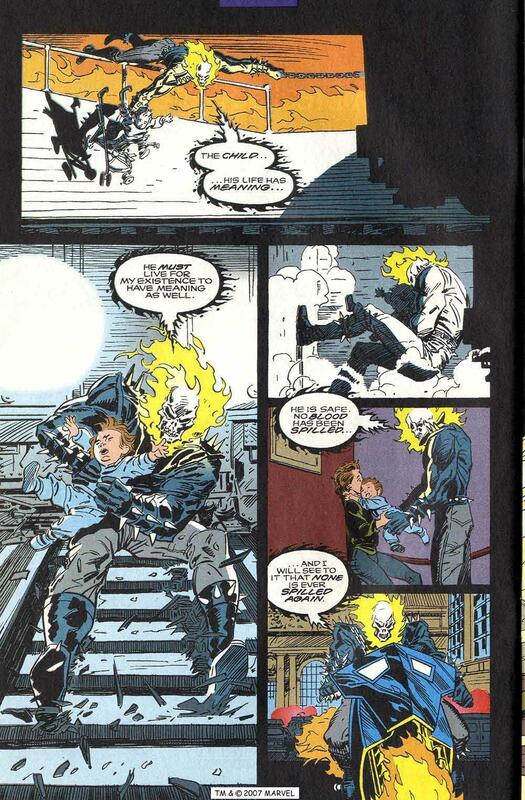 I really cannot describe what a huge deal it was to see Ghost Rider execute the Penance Stare in the 90’s. I never, ever got tired of it, although I guess others did. The idea of a FLAMING SKULL staring fire into someone’s eyes that makes said someone feel the pain of all the evil they have done fascinated me, and it continues to fascinate me to this very day. 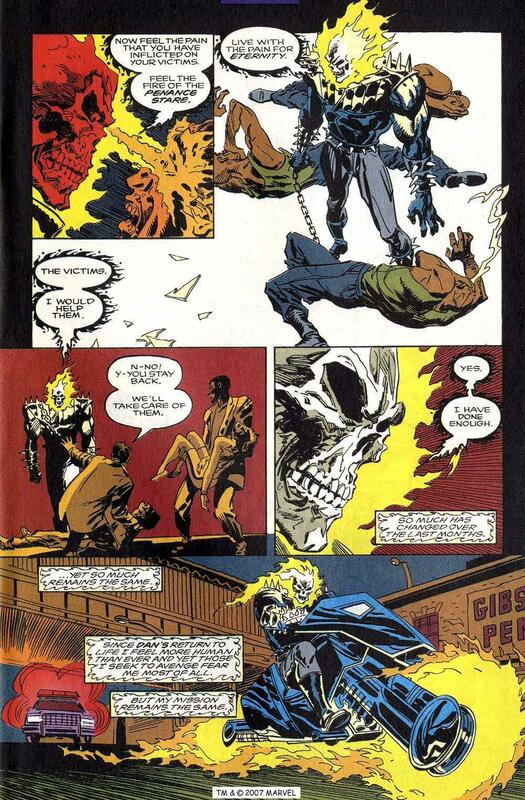 The 90’s may have gotten some things wrong, but for a good 2-3 year period, they got Ghost Rider in a way that has never been equaled, before or since, and Howard Mackie’s writing has a lot to do with that, in addition to the great art by Mark Texeira and Javier Saltares on the book’s first few years as well. Bret Blevins is terrific here; the art really gave GR that Horror Hero look you have to know they were going for. They should start having motorcycle lasso competitions at rodeos. Ghost Rider follows up his Montana impression by saving the baby while telling us that the baby’s life is full of meaning. No blood has been spilled? Didn’t the cop that Madcap turned insane shoot like six people? 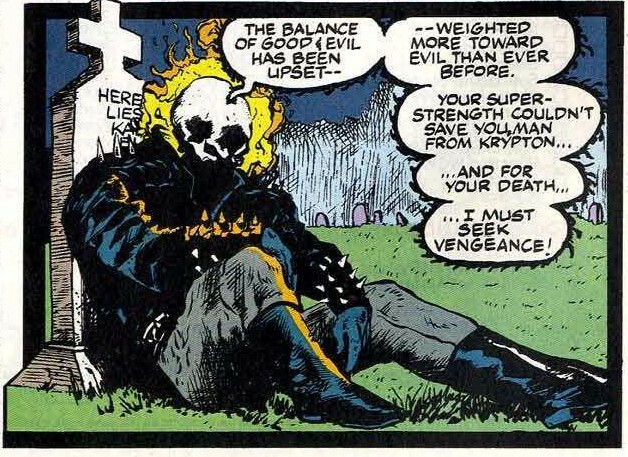 I love tying Ghost Rider’s role as the Spirit of Vengeance to protection of the innocent, and I think that is what separated him from other vigilantes like Punisher. I mean, sure, Frank Castle saves some innocent folks, but his mission isn’t tied to that role the way Mackie is presenting Ghost Rider’s as being. Of course, his anathema towards killing also separated him, but I like my horror heroes with a smattering of hope. I am not sure that horror of any kind, even the awesome amalgam of horror and superheroes, works without hope. I would call that creepy, but that would just not be a word with enough weight to describe how I feel about this image and about Madcap in general; truly very few characters personify madness the way Madcap does, and few stories would bring you the Madness you crave in the third month of the year (TAKE THAT, NCAA)! That is the sort of next issue blurb that hooks me every time! Before I finish this up, I also want to point out a really cool tidbit from the letters page. This issue of Ghost Rider came out at about the time that Doomsday killed Superman, and there aren’t many that come more innocent than The Man of Tomorrow! So, in the bottom right corner of the letters page, we get to see Ghost Rider’s thoughts on the situation! We talked about how cool and brutal Doomsday was in a prior article here at The Unspoken Decade, and I think just about every superhero fan of the 1990’s would have loved to have seen Superman’s killer tangle with everyone’s favorite burning skull-faced hero? That would have been beyond epic! 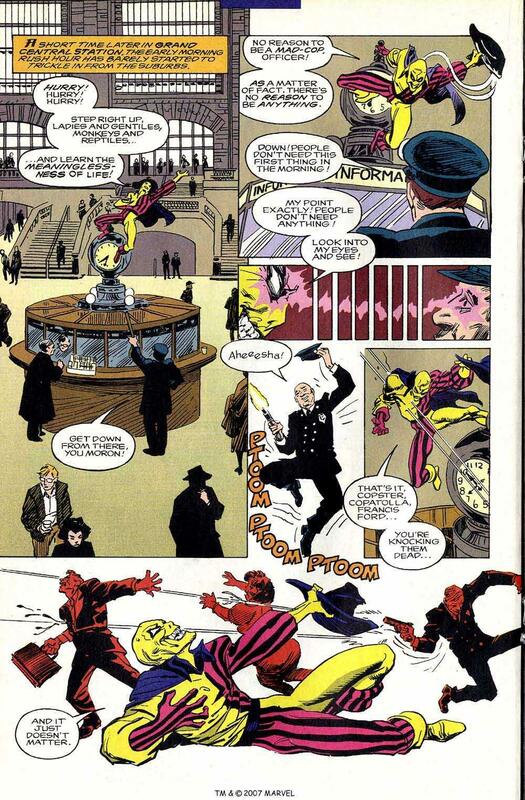 I wish that DC and Marvel had managed to do that when they were crossover happy in the 90’s! I loved this panel; I think it is the equivalent of an Easter Egg on a DVD. I did not have to work as hard to find it, but I also certainly was not expecting it. Ghost Rider’s mourning of Superman also made the overall issue even more enjoyable, and I am too embarrassed to tell you of the crossovers this inspired that I played out in my action figures or in the backs of my notebooks at school when I should have been learning Algebra, which I made a “D” in that semester. My mom was mad, but I managed to keep my comics! Thanks for reading, and I hope you enjoy the NCAA Tournament as much as I do! I’m ready to enjoy some madness, some Cinderella teams (as long as they don’t beat Kansas! ), and attempting to eat more snack food than is humanly possible as I hope for a deep run for my Jayhawks! Stay tuned this week for Mr. Hero from Emily Scott, and Venom: The Madness from Darry Weight! Have a great big dance, everyone!